I had a reader, Emily, write in and ask for some tips on traveling with kids in light of the upcoming spring break season. It is a great question that I thought maybe others are looking for some tips on, too. While we don’t travel a ton, we do go someplace out of town usually once a year, and usually that means that we’re heading off in our car…or a 12 passenger van in our case! Print off these kids conversation starters to have some great conversations along the way! Even if we’re not traveling for a day or two, we are so often in our car, often for extended periods of time because we have so many kids who are involved in various activities. It is not uncommon for us to drive at least an hour away once a weekend in the summer. From these experiences, I find these 10 things to make it so much easier when traveling with kids. It is easy to get excited about the being someplace new part, but not so much about the getting there part. I find it beneficial to start talking about the traveling part with my little kids well ahead of the time. I do my best to explain the length of the car ride in terms that they can understand, and I also explain it within the context of having an adventure. This gets them excited even for the car ride. I say a few because we are going to be packing the bulk of their things to do ourselves. Having them choose a few things like a favorite stuffed animal, book to read or action figure or doll generally works well. This builds up their anticipation for the big event. If they aren’t able to play with their favorite toy or read their favorite book for a week or two while you are preparing for the trip, they look forward to having it again. I love this desk for kids. It is great to keep all their things inside, and they think it’s really cool! Can I just say, no mess? After all, don’t we all love surprises? If you don’t have a lap desk that opens like the one above, a special backpack or bag will do the trick. Again, keeping it specific for longer distance travel is important. Sometimes I have not always been so smart in this department. Avoiding sticky things, crumbly things, or things that the kids can’t get out of a wrapper or package quickly don’t make my list. I also pay attention to limiting the amount of sugary things since kids bouncing off the walls of the car usually isn’t pretty. I really don’t worry much about my kids getting dehydrated in a harmful way as s result of the car trip. Of greater harm to me is the risk of getting on and off highways, using germ public restrooms, and dealing with the trauma of possible potty accidents if we can’t get to one in time. All of these risks are minimal, but then again so is the dehydration risk in my book. Remind them of what is coming, what is involved in a way that they can understand, of what your expectations are, and of what the outcomes are to the choices they make in regards to these expectations. This means to start making sure that people are getting the right amount of sleep a few days ahead of your trip. And this also includes the parents! So often we can all be so busy preparing for the trip that we neglect the personal care of ourselves and others. Often it is sleep that takes the biggest hit. It can be tempting to think that traveling with tired kids will be a good thing, but I often find this to backfire. A well-rested family means a family that is likely to fight and bicker, a family that is less likely to be whiny and demanding, and a family that has more patience for being trapped in a car. Making sure that everyone gets ample rest for a few days ahead of the trip is a very good thing. 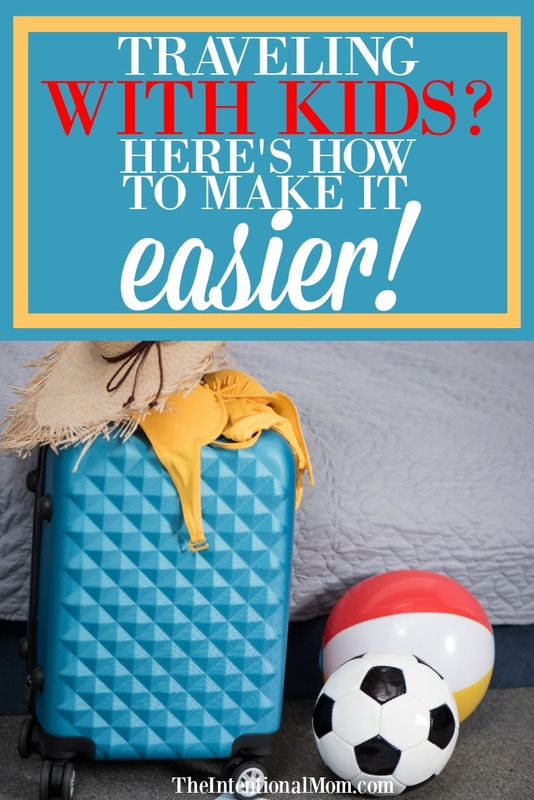 Traveling with kids can be a challenge, but there are some proactive things that you can do to make it a bit less of an ordeal. The next time you are getting ready to travel either in a car or plane, try some of these 10 things to make it easier. Wow! Thank you!!! We will actually be doing our first trip out of state for the first time with our four young kids. I am so buying some of these! THANK YOU!!!! you’re welcome! That is so exciting. We really do love traveling with our kids! Great tips, I totally agree with you about taking some kind of entertainment for the kids when traveling. I have found out that without any kid of entertainment they will fidgit a lot and will irritate a lot as they will be bored.